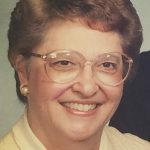 Helen Wright, 93, of Savoy, formerly of Champaign, passed away peacefully with family by her side on Monday, March 25, 2019 at MeadowBrook, Urbana, IL. Helen was born September 30, 1925 at San Fernando, California, daughter of Raymond Giddle and Anna Wetzstein Giddle. Beloved wife of Rollin G. Wright for 71 years. Devoted mother of Lorelyn (Jack) Evans of Hillsboro, Illinois; Michael (Robin) Wright of Ft. Meyers, Florida; Cynthia (Michael) Lynk of Bismarck, North Dakota and William (Tina) Wright of Medway, Massachusetts and nine grandchildren and three great grandchildren. Helen was preceded in death by her parents and two sisters, Colleen Fenton and Fern Crawford. Helen graduated from Van Nuys High School, Van Nuys, California in 1943. She and Rollin were both confirmed and married in the First Evangelical Lutheran Church of Van Nuys. During World War II, Helen worked for the Lockheed Aircraft Corporation and later for the Los Angeles School District. After raising her four children she worked in the Admissions and Records Department at the University of Illinois, where she loved interacting with the students who were seeking help and guidance. Helen was a member of the St. John Lutheran Church, Champaign, Illinois where she was active with the Mary Martha Society. She enjoyed traveling the United States and visiting with family. There will be a Celebration of Life Service for Helen at Morgan Memorial Home in Savoy on Saturday, March 30, 2019 at 11:00 a.m. with Rev. Jeff Caithamer officiating, preceded by a visitation at 10:00 a.m. The internment will be private at the Prairie View Cemetery in Savoy at a later date. In lieu of flowers, donations may be made to an organization of the donor’s choice. Mike, Robin and family, our sincere condolences to you and your family during this sad times. You are all in our thoughts and prayers. Peace be with you and all your family. Sorry for your loss. Words alone cannot take away the hurt from losing a loved one. I hope that your faith that she is in a better place will comfort you. Bill and Tina I am so sorry for your loss. Your Mom looked a loving woman. You're in my thoughts and prayers. Dear Bill and family....so sorry to hear of your mom's passing. My heartfelt condolences. We are very sorry for your loss, and are praying for your family. We love you Bill!